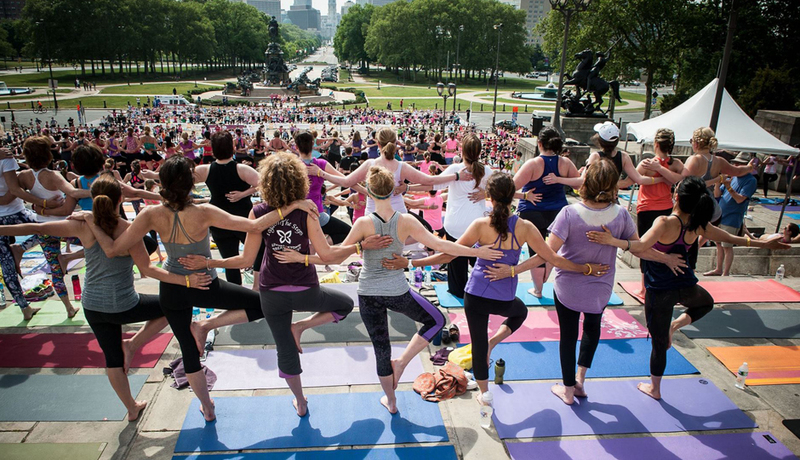 Read on for Philadelphia fitness events happening in October. Photo by Reach & Raise via Facebook. Original article by Be Well Philly. Sure, we may *officially* have entered the fall season, but that doesn’t mean the outdoor workout fun is totally over. Join some free fitness at Dilworth Park, hit up a class at Cira Green, and enjoy some fall twists on classes — like a BYO pumpkin boot camp! 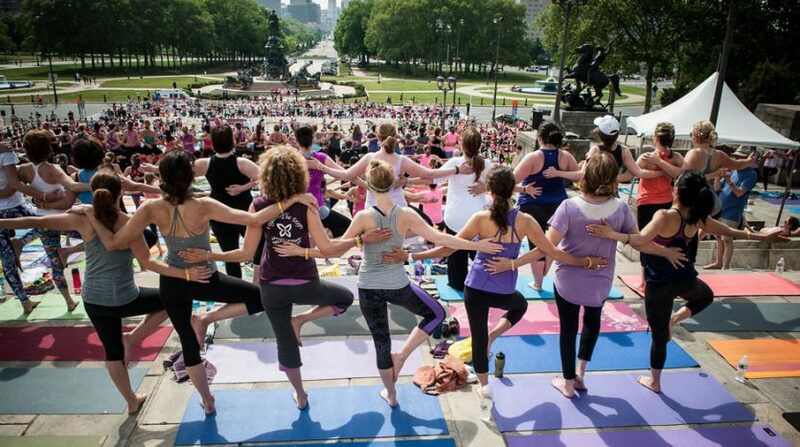 Read on for more Philadelphia fitness events happening this month. HUMMUS REPUBLIC GRAND OPENING Yes, this Rittenhouse eatery technically opened months ago, but they’re celebrating their grand opening now. It’s good news for all of us though: In honor of the celebrations, they’re serving up $1 pitas, bowls, and salads for lunch. $1, 11 a.m. to 1 p.m.
FREE CENTER CITY FIT Thanks to the Center City District, you can join trainers from Optimum Sport Health Clubs for free workouts at Dilworth Park on Monday and Tuesday evenings through October 16. Free, 6 p.m.
BPM AT CIRA GREEN Join BPM Fitness for a HIIT workout on the grassy rooftop at Cira Green. You’ll get in an intense 60-minute sweat session, then have the chance to win a full outfitting from Lululemon. Find tickets here. $10, 6 p.m.
ROOFTOP BOXING + BEATS Ardmore’s Fuel Cycle Fitness is taking over the rooftop at Riva Health & Wellness for a fitness party you don’t want to miss. Take in the views while sweating it out to the beat of a live deejay during an hour-long cardioboxing class. $25, 6 p.m.
FREE HIIT WORKOUT CoreFitness’ free Workout Wednesdays start today and continue on October 17 and 31st. Plan on joining the free, 30-minute HIIT sessions at Commerce Square and going home with $40 off a five-class CoreFitness package. Pre-register here. Free, 5:30 p.m.
FALL FLOW FOR BASIC YOGIS From pumpkin spice lattes to Ugg boots, fall really knows how to bring out our #basic side. At this yoga class hosted at Yoga Hive, you’ll do a flow surrounded by fall decor, then chow on apple cider doughnuts, banana bread, and pumpkin spice drinks. Find tickets here. $20, 7 p.m.
FREE SANSON STREET DONUT RUN Saturday mornings are better with group runs and Federal Donuts. Meet up at Philadelphia Runner’s Sansom Street store, run three-ish miles, then end back at the store for doughnuts and coffee. Find more info here. Free, 9 a.m.
URBAN FARM BIKE RIDE Take a tour of Philly’s urban farms that are led by and feed people of color. The bike ride will start and finish at Philadelphia Brewing Co. on Frankford Avenue, and tickets will benefit Food Moxie, an organization that empowers people to connect with the earth and grow their food. Find tickets here. $30 early bird, $35 after September 28; 8 a.m.
REVOLUTIONS FOR RESEARCH Taking an extra-long spin class to a live deejay while raising money for cancer research? Count us in. Revolutions for Research, which benefits the American Association for Cancer Research, is going down at The Fillmore this month. Register here. Starts at $50, 8 a.m. PINK YOGA CLASS Honor Breast Cancer Awareness Month with a pre-opening class at Bloomingdale’s in King of Prussia and Willow Grove. CorePower Yoga will lead the hour-long class, and tickets will go to benefit the Marisa Acocella Foundation and The Carey Foundation. Find tickets here and here. $10, 8:30 a.m.
CLEAN BEAUTY EVENT Taking more care in the stuff you put on your skin? Same, girlfriend. That’s why we’re excited that Brands to Believe In is hosting this event to showcase great brands we can get behind — with samples to take home to boot. Find tickets here. $25, 12 p.m.
REVIVE & RENEW YOGA Hit the rooftop at Cira Green for this ultra restorative practice with yogi Jade Javon. Unwind with a 45-minute yoga flow, followed by a 15-minute meditation. Find tickets here. $15, 4 p.m.
SELF-CARE SUNDAY Head to Vitality Meditation for an afternoon of self-care with Four Love Yoga. Take a power vinyasa class, followed by guided meditation, astrology readings, and healthy refreshments. Find tickets here. $49, 1 p.m.
5,000 YARDS DASH 5,000-yards raceRun to Yards Brewery in this that’ll end with quite a bash. Indulge in food truck fair while drinking a complementary Yards beer. Register here. $45, 8:30 a.m.
PUPPY YOGA Puppies. Yoga. A class benefitting Morris Animal Refuge. Do you need more reasons to get this Amrita Yoga & Wellness class on your calendar, ASAP? Didn’t think so. Find tickets here. $25, multiple session times. COREFITNESS ULTIMATE RETREAT Get out of town with CoreFitness during this three-day fitness retreat at Icona Beach Resort. Think: Daily workouts, in-room massages, healthy eating, and zero stress. Register here. Starts at $629. ALL-CITY 20 MILER Training for the Philadelphia Marathon? Just feel like spending your Saturday doing a, er, really long run? Join Philadelphia Runner, Students Run Philly Style, Team Philly Race Training, and the Philadelphia Marathon in a training run that’s your choice of 10 or 20 miles long, starting and ending in the Azalea Garden. Register here. Free, 7 a.m.
PILATES & POURS AT ECLIPSE BREWING Erin Chambers from Real Girl Pilates will lead an hour-long Pilates class at Merchantville’s Eclipse Brewing, followed by a pour or flight of beer. Find tickets here. $20, 10:30 a.m.
BYO PUMPKIN BOOT CAMP Bring your own pumpkin for this seasonal boot camp with CoreFitness on the Art Museum steps. Score two spots for $20 if you mention Be Well Philly when emailing gina@core-fit.com for tickets. Find tickets here. 9 a.m.
DAYBREAKER PHL This early morning workout and dance sesh at Noto gets a spooky twist with this Halloween Ball-themed workout with Osayi Osunde, followed by a dance party with Rich Medina, plus kombucha, matcha lattes, and breakfast snacks. Find tickets here. Tickets start at $15, 6 a.m.
HALLOWEEN CANDLELIGHT FLOW All witches and warlocks are invited to join this candlelight Yoga Hive class to your favorite Halloween music hits. Come dressed in costume — the best dressed will win a prize — and plan to indulge in Halloween treats afterwards. Find tickets here. $25, 7 p.m.
Read more at Be Well Philly.